Night Photography has many small tips and tricks to learn that can make a huge difference even by a new DSLR users. Here are some more tricks. To have a greater chance of success in our pictures taken after sunset, there are a number of other steps that we can put into practice. These are settings which are less well known those are best to take into consideration and give special attention to the preparation at the time of shooting. By default, all cameras automatically activate the night mode when you press the shutter button. This function is very useful to take to take pictures faster. One quickly realizes that; however, that as night it can become an obstacle too. At night, our eyes adjust to the dim light automatically. So, if we are looking through the camera viewfinder, press the shutter button and the screen light is activated, the light produced by the latter is enough to blind us and prevent us from seeing what we are framing. The solution to this problem is very simple. Somewhere in the camera menu, you will find an option to disable the automatic activation of the screen light. In this way, it will remain off unless the buttons on the camera is used to specifically activate it. Of course, this advice has no validity for compact cameras, which are devoid of the viewfinder. In this case, the screen can not be disabled because it is the only tool available for framing. Similarly, it might be helpful to disable the automatic preview of the shot. At Long Exposures more than a few seconds (as in case of night shots), the time of the creation of a picture is doubled, or for taking a picture you have to wait for another 16 seconds before you can take another. The quality of the noise reduction built into the camera is not always excellent, sometimes it is better that offered by photo editing programs. The best solution is to try to make some shots with and without noise reduction. If you notice there is an excessive loss of sharpness in the picture where it is enabled, disable it and then it will be better to intervene via software. The pictures of night are better in the cold season or at least not in the summer. In fact, usually, in the hot season the sky is veiled, as the accumulated heat from the earth during the day evaporates and creates a sort of haze. This implies that a photographer at night should have to suffer from the cold. It is better then to dress well and maybe bring something warming to sip while the shutter remains open for several minutes. Another very important thing to keep in mind is that, the battery will discharge faster at lower temperatures. So it is better make sure that it is fully charged before you leave home. Still better to have more than one battery and ensure that all batteries are fully charged which are in your possession. In the dark we could struggle to correctly identify the best location from which to take a picture. It is good, therefore, to do a little exploration while there is still sunlight and identify the most interesting points of view, any obstacles that could prevent us from placing us and our camera and possibly the best paths to reach these points. It would be a good idea to obtain a remote control, which allows us to take pictures without pressing the shutter button on the body. In this way, we can avoid imparting vibrations to the camera, due to the long exposure time and avoid to spoil the picture. If we do mot have a shutter release, we can use the delayed shutter release function. In this case, we are careful about how we can press the shutter button. The delay is intended to give time to the vibrations that may have imprinted the camera to stop. If these vibrations are too intense, even the delay will not be enough. Then, press the shutter button in a delicate way : first press it halfway, when the button begins to resist, then press the bottom to full and release it carefully. At this point we can move away from the camera and do not bump into the tripod legs. This Article Has Been Shared 2486 Times! Advanced Tips for Still Life Photography focuses on calculation of the exposure and white balance; apart from the tips for the needed guide for illuminating. 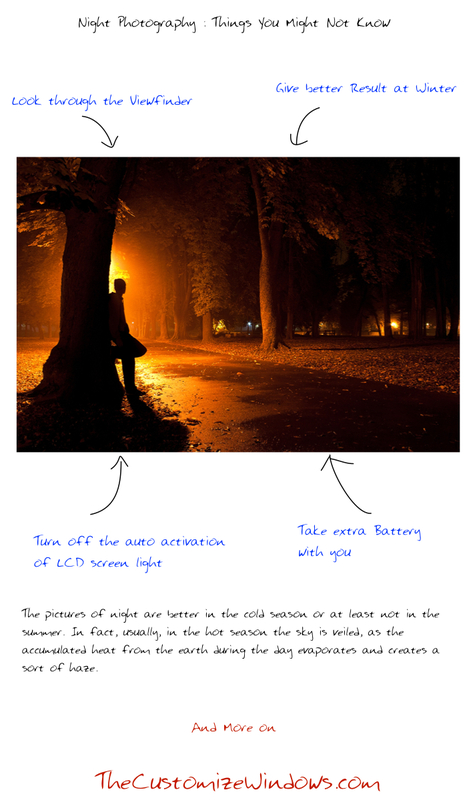 Cite this article as: Abhishek Ghosh, "Night Photography : Things You Might Not Know," in The Customize Windows, August 2, 2013, April 19, 2019, https://thecustomizewindows.com/2013/08/night-photography-things-you-might-not-know/.